For day-to-day supplies such as perishable food, provisioning the boat is similar to on shore. Every few days while we are in port, my mom makes a list of fruits, vegetables, meats, etc. and goes into town to shop. We have to use taxis or busses if the store is more than a mile or so away from a dock, but other than that the shopping goes much the same. The biggest differences are in what we buy. For example, we only get a few frozen goods and almost never buy liquid milk. We also tend to buy certain things in some places, and not in others. For example, while eggs are almost universally available, in some areas they are so expensive we hardly buy any. In other places (French islands, for example) we nearly always buy a baguette (French bread, cheap but it only stays good about 24 hours) every day or two for lunch. Some of our most sought-after provisions are fresh fruits and vegetables. For example, mangoes, papayas, lettuce, and celery aren't exactly rare treats, but they don't keep long so we like to get them when they are available. Meat is another thing we try to keep in stock, but our freezer is so small that we can only keep a few meals-worth on board. We always look for supplies that do not need refrigeration (or not much) and don't weigh much. In some ways it is like backpacking, except we do have a fridge and small freezer, and can carry more weight and bulk. Nonetheless, we always have powdered milk, powdered or concentrated juices, and even powdered eggs. Similarly, we buy in bulk and vacuum seal staples for storage, and make most of our own food from scratch. For example, we get bulk oats whenever possible, and bake our own granola for breakfast. We also consider money. Although we keep well stocked with a (usually) good assortment of food, items like soda are considered real treats. There are places where a soda (or beer or juice) can be more than $1 US per can. Similarly we have few snack foods such as chips. To offset this, we bake a lot (cookies, cakes, pizzas, scones, etc. ), nearly always from scratch. Fortunately, staples like flour, sugar, butter, and so on are usually relatively cheap. 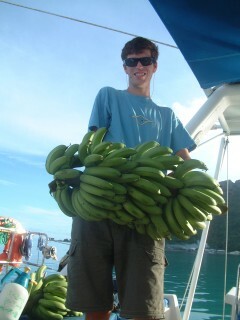 Of course, the main significant part of boat provisioning is providing food for weeks or even months away from stores. There is a wonderfully wide variety of easily stored foods today, including ready soups, cooked and canned chicken, freeze-dried fruits and vegetables. 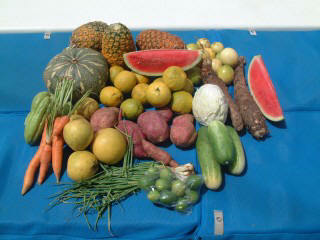 We stock up on these, fill up our fridge and freezer, and buy as much fresh produce as we can carry. Buying lots of food is really just a matter of money. Storing it, however, becomes a lesson in space utilization. We maximize our fridge and freezer space by stocking up on things like cheese and boneless meat, which fill space efficiently and provide good protein. Well-sealed items, like bottles (not that we buy many, glass is heavy), can be put in the bilges or outside storage where a little dampness won't hurt them. Long-term supplies like extra flour, nuts, and cat food are vacuum-packed to keep them fresh and keep out weevils. Some large, awkward things like squash and cans of milk powder are stored in cabins (especially the spare cabin). Most of our food goes into one of eight compartments under the seats in our salon, or one of five compartments behind the seat backs. We have had, at one time, literally a ton of food on board! In addition to helping us find our dinner (though it can still be a search, getting to anything in 'Seat 7 bottom' is a pain), the list helps us figure out what we are using, what we aren't, and what we need more of. This simplifies the creation of shopping lists and planning of meals. The list also helps us figure out what we have had for a long time and therefore need to eat (or drink, since even boxes of juice don't last forever). If all this sounds a little excessive, try to imagine securely storing four months of food in out-of-sight cupboards (no pantries) around the entire house. There is one other thing people ask about when we talk about provisions, and that is fishing. My parents say they used to average about one fish every 10 hours of fishing time. This resulted in so much food that they would actually get tired of fish and pull the lines in because they couldn't eat their catch fast enough. Well, I don't know about that, but at a guess, I'd say we average a fish every 10 days of fishing time (by 10 days, I mean 240 hours.) Maybe that is a little harsh, but then again perhaps not. 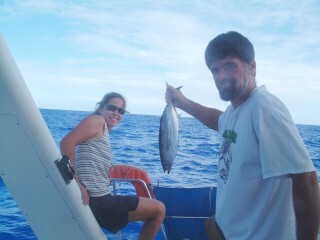 We didn't catch any fish in the Caribbean for months, and on our last 13-day passage, we only caught one. So in answer to all those questions, we are not sick of fish and if we had to live off our lines, we'd all starve! For more on provisioning, see my mom's provisioning section.